Confession: I'm a major procrastinator. Despite having some gorgeous family photos taken three years ago with Bethany Schiedel, we still haven't printed any to put up on the wall. I decided to take another crack a family photo with Bethany again, since our family has grown another kid since the last set of photos. Fortuitously, I got an email from CanvasPop just before our recent family photo session, offering a large art print of any photo we'd like, so I could review it. Perfect! After we got to see our photos from the mini session with Bethany, I chose one & uploaded it to CanvasPop. I didn't have long to wait. Ten days after sending the image, I got a tracking code for FedEx. Then four days after that, a large package arrived at the door. I couldn't wait to open it. 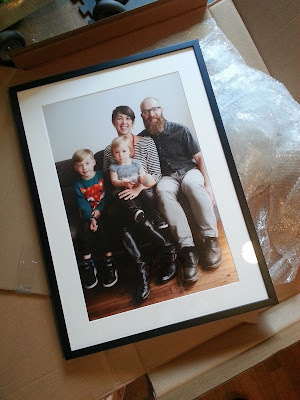 It took me a while--our photo was wrapped in several layers of bubble wrap, then a couple of layers of cardboard. Finally got that last bit of tape & bubble wrap off, et voila! Gorgeous! Simple black wood frame with glass over a white mat. The photo is huge--I was a little hesitant to have a picture of us so big--but it looks amazing. The file I uploaded was very high resolution (18MB, if I remember correctly) & it's crystal clear--really beautiful quality printing. The back has a wire hanger, so it's all ready to put up on the wall right out of the box. Every time I see the photo on our wall in the living room, it makes me smile. I'm a big fan of DIY, but it is a bit nerve wracking to send off photos to a drug store print lab. I've screwed up the image format before & ended up with a photo that was cropped badly. Then a trip to the store to pick a frame & the fiddliness of trying to centre the photo in the mat & get it all back together without any bits of dust under the glass. Ordering from CanvasPop was really easy & the results look so professional. CanvasPop, as you might guess from the name, specializes in printing images on canvas stretched over a frame. You can get anything from 8"x10" all the way up to 24"x72", with prices starting at $41. Turning Instagram images or Facebook photos into art for your walls is simple with a very streamlined, easy to use website. Disclaimer: I received a framed art print from CanvasPop for free to facilitate this review, but was not otherwise compensated for this post. The words & opinions above are my own.